I have previously posted my recipe under Pasta and Vodka. This is a little different from that recipe but equally as delicious. My Grandson Brody loved the original but didn’t love the pieces of tomato in it. So this time out I gave it a spin in the food processor and got out all those little pieces of tomato that he didn’t like. This is what I did last night and it was delicious. 1/2 cup 1/2 and 1/2 or heavy cream–I used 1/2 and 1/2 this time — if you’d like it creamier you can add more cream, I used 1/2 cup and it was fine. I use a large skillet pan. Add the olive oil and heat until shimmers then add the minced garlic and red pepper. Cook garlic and red pepper and stir until fragrant but not browned, about 1 minute. Add the vodka and cook down until it is nearly evaporated there will be a little liquid in the pan. 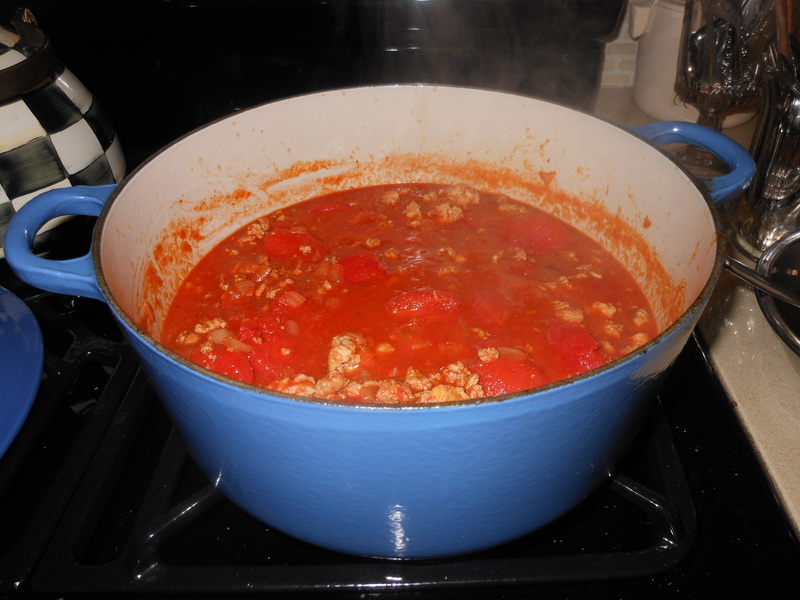 Add the tomatoes– while they are cooking I use a masher or a wooden spoon to break up the whole tomatoes. Lower heat to medium-low and simmer for at least 30 minutes. I then let it completely cool down. I get out the food processor and put it all in and add the fresh basil and then I puree until smooth. Return sauce to the pan and add the cream. You want it to be creamy , I used 1/2 cup and it was fine you can always add more if you’d like. Cook until warmed through and right before using stir in the parmesan cheese and then add the cooked pasta. Toss to combine in the large skillet. 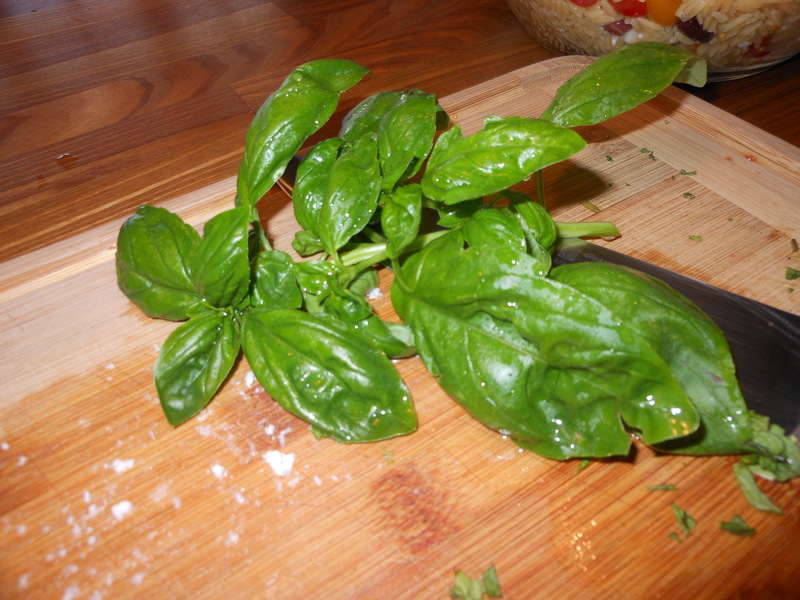 Serve immediately with additional cheese on the table and you can add a little more fresh basil if you’d like. 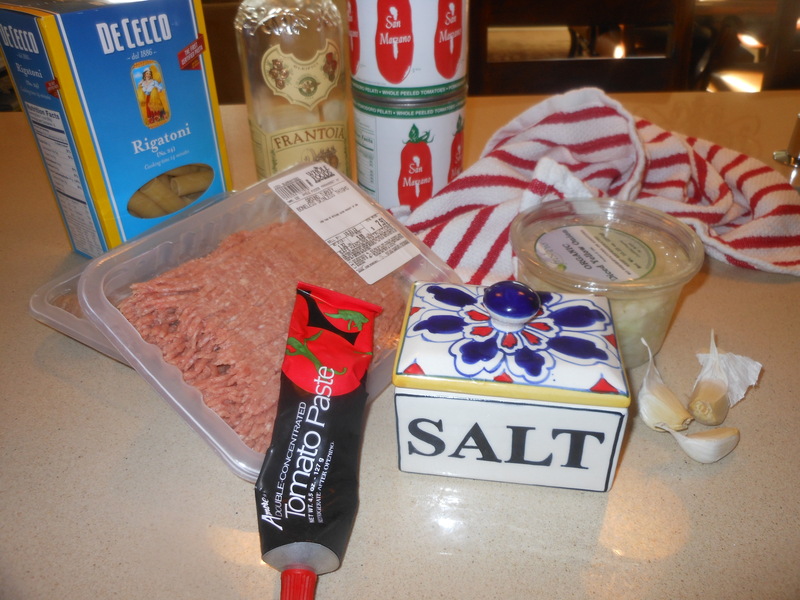 I love my Bolognese recipes which are also on this site. Sometimes I just want to use my slow-cooker so that my meal is ready when I am home at the end of the day. This is what I did and I have to say it came out very tasty. I made all 4 lbs. of ground beef ( you can sub turkey or chicken if you would like) and I had about 4 meals out of this. Perfection! I froze in individual containers for 3 meals after the night we originally ate it. It’s perfect for the cold winter nights ahead of us. File this under cozy comfort foods. Heat 2 Tablespoons of the olive oil in a large skillet over medium heat. Add the mirepoix ( carrots, celery and onions) season with salt and pepper and cook until softened and onions are transparent ) app. 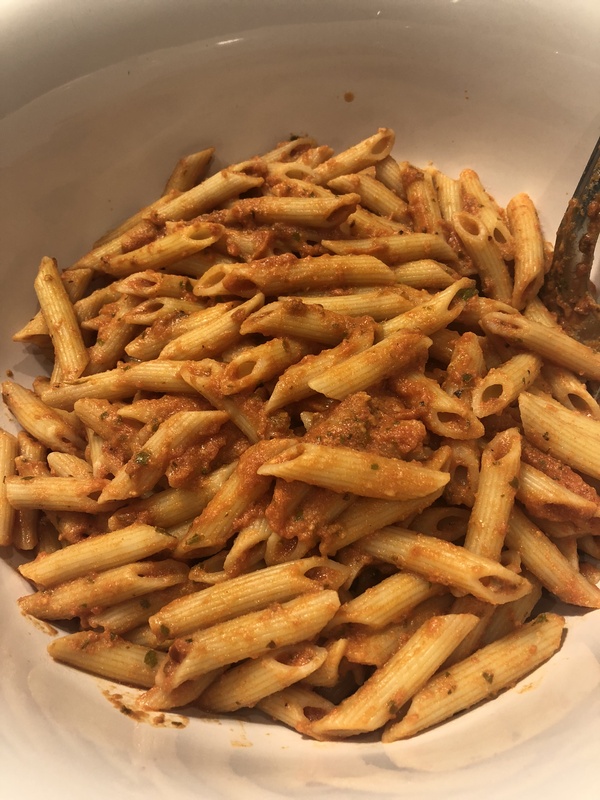 10-15 minutes — I stirred in the garlic at the end and then added the tomato paste , stir around and cook for another few minutes. Pour in the red wine. Cook until most of the red wine is evaporated, app. 5 more minutes on a low flame. Pour this into the slow cooker. Pour the remaining 2 Tbsp. of Olive Oil into the same skillet, add the beef and season with salt and pepper, cook breaking up the beef until it is nicely browned about 15 minutes. Drain off any excess fat. Stir in the milk and continue cooking until it is mostly absorbed by the meat, app. another 5 minutes. Add this to the slow cooker along with the tomatoes and all the dried spices. Add some more salt–taste for salt I was pretty generous with the salt. Give the pot a good stir , cover and cook on low for 6 hours. I didn’t have any fat to skim on top because I drained the fat earlier and used 15% fat ground beef. The totally lean beef is a little to dry for my liking but use what ever meat you like. Check the consistency if it is too thick add a little bit of water. If it is too thin, cook for another 30 minutes or so with the cover off. I have to say mine came out perfectly after 6 hours in the slow cooker. Taste for seasoning and add salt and pepper if you desire. Also a little note about slow-cooker, once the initial cooking process is over my slow cooker goes to warm and will stay on warm for another few hours or so . This is perfect because it will not cook anymore just stay warm. This is what I did. 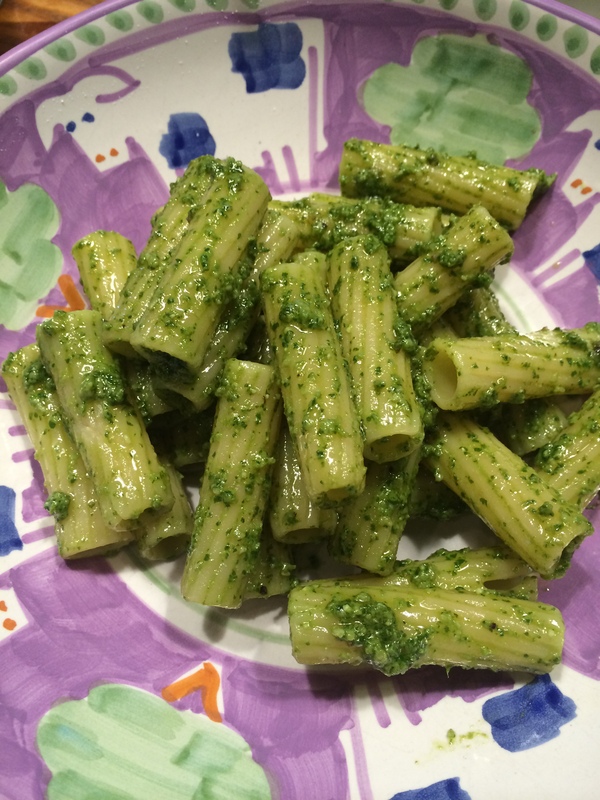 Serve over pasta with lots of grated Parmesan Cheese and top with fresh basil and fresh parsley if you’d like. By all means freeze the extra in air-tight containers for another few meals! Amatrice is a small town in Italy outside of Rome and this dish is named for it. This dish is intended to be made with guanciale , which is a pig jowl and it tastes like a porkier version of bacon or pancetta. 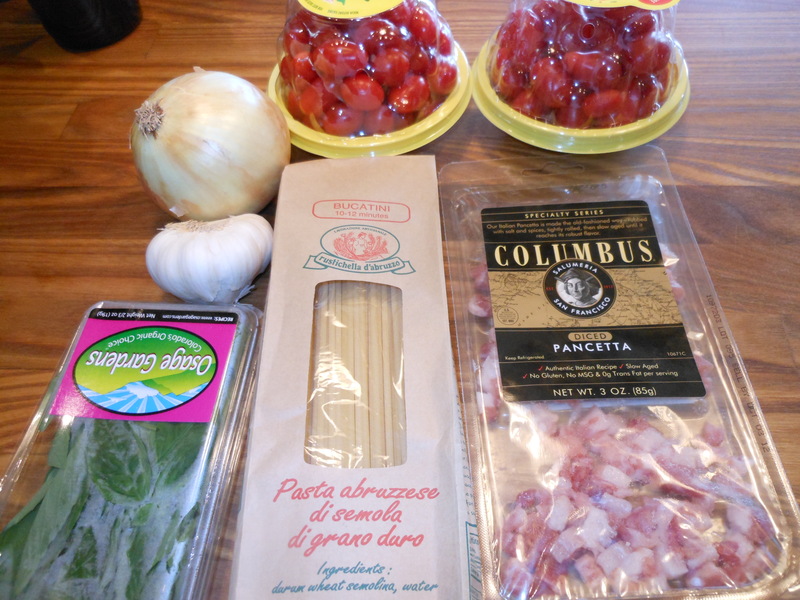 I use pancetta, which now comes pre-diced in packages making for a very easy time. I also keep packages of the diced pancetta in my freezer, they defrost very quickly which makes them a perfect dinner ingredient. I also use bucatini pasta which is thick and ropey with a hole like a straw. I wouldn’t wear white while eating this it’s a messy one. Super easy and delicious. I made it tonite with my marinated flank steak. 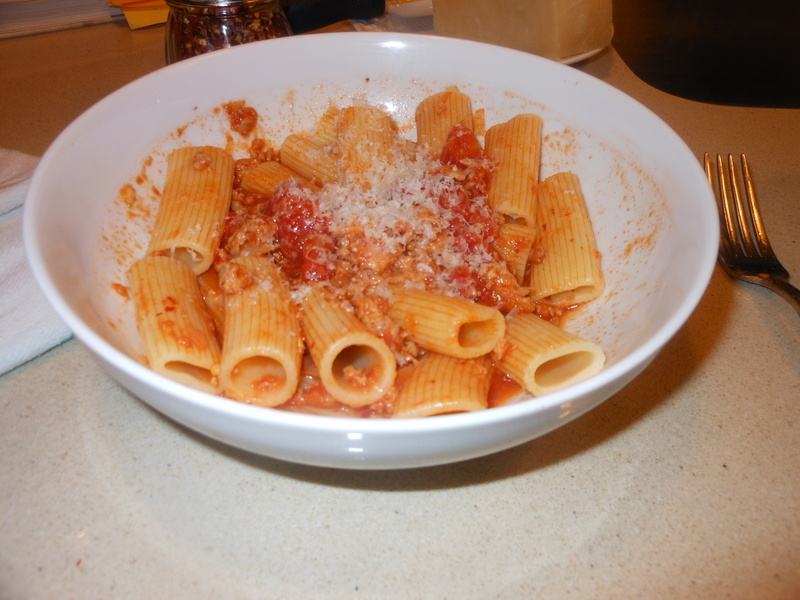 I also used 2 containers of grape tomatoes, but you can easily substitute with 1 large can of San Marzano tomatoes ( crushed )The cherry/grape tomatoes give it a lighter sauce, and I prefer it especially in the summer months. 1 lb. bucatini ( you can obviously use 1/2 pound and save any leftover sauce to freeze for another time) any thick spaghetti will do but I love this one in this recipe. Perciatelli is another good choice. In a large heavy skillet, heat 2 tablespoons of olive oil over medium heat. Add the pancetta and cook, stirring constantly. I like my pancetta crispy, but just get it golden brown, about 5 – 7 minutes. Using a slotted spoon remove pancetta into a separate bowl. Add onions to olive oil till translucent, about 5 minutes. Stir in the garlic and red pepper flakes , I do this off the heat. I then add all the tomatoes, some kosher salt ( to taste) and some black pepper and add back in the pancetta. 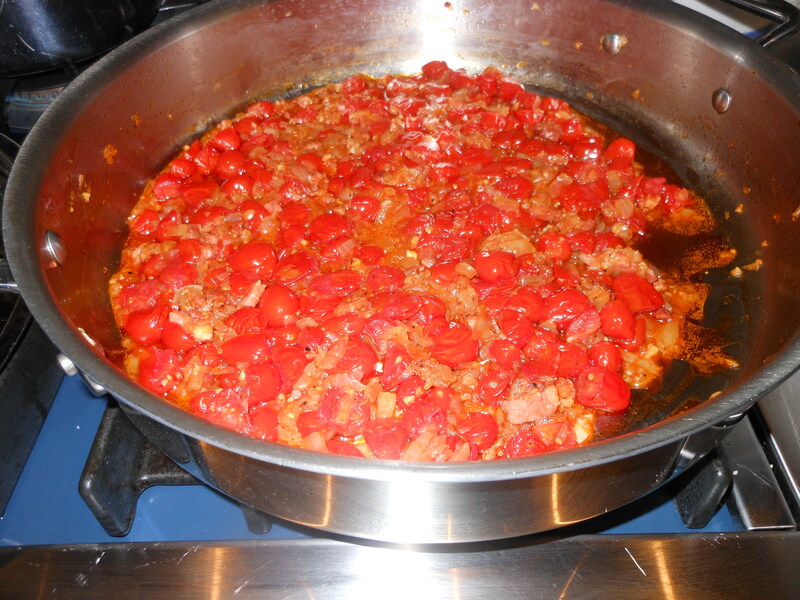 I also add 2 tablespoons of olive oil and cook the tomatoes till they start to break down and form a sauce. Taste for salt and pepper. Simmer uncovered for at least 45 minutes , up to an hour for perfect sauce. Cook Pasta according to package directions, tender but still firm to the bite. Before draining pasta take out about 1 cup of pasta water and set aside. 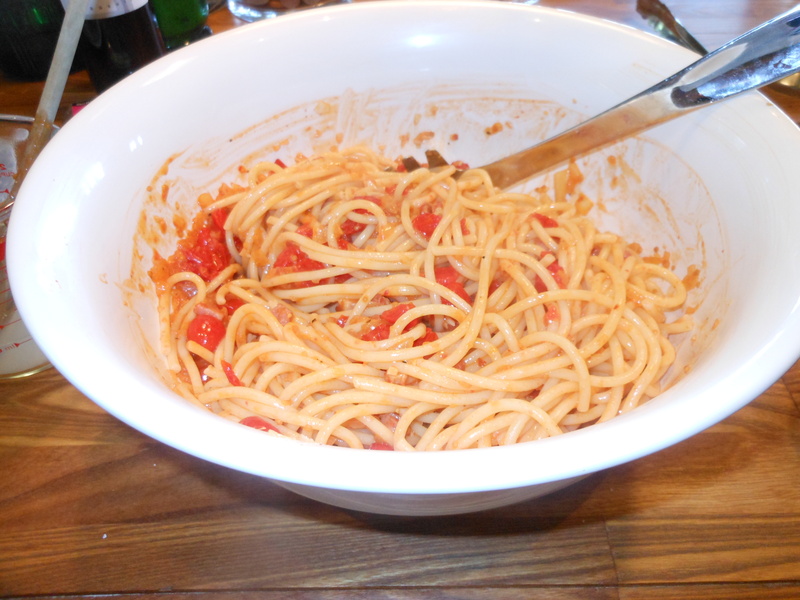 Drain the pasta and place in a large serving bowl, I add a little of the pasta water and then I add the sauce. Toss gently and serve. I served with Parmesan Cheese . Nothing better than a really fresh tomato sauce , so fresh that you don’t even have to cook it. Just let the tomatoes marinate for a few hours with some olive oil , basil and a few spices and you’re good to go. 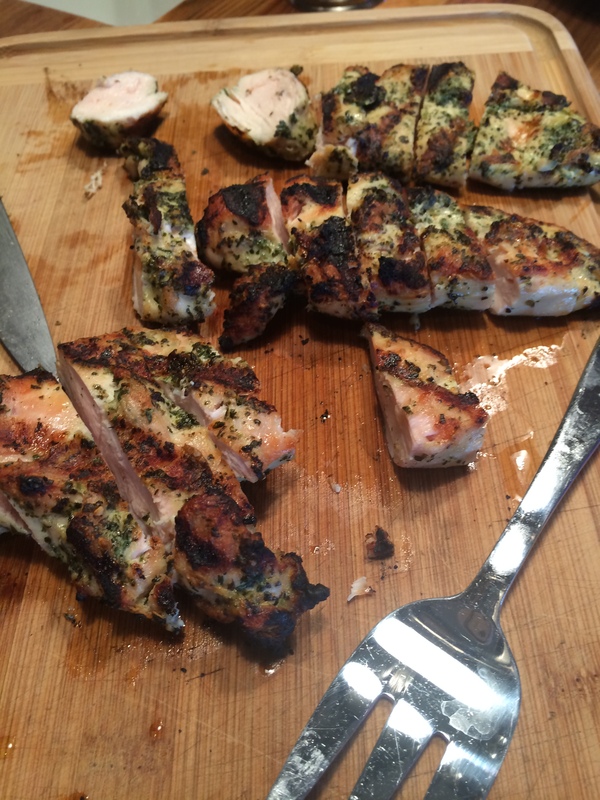 So very easy and delicious. A must go-to for summertime and why not anytime? The only down side to making this sauce is that I really feel it needs to marinate in the refrigerator for at least 2 hours and really 4 hours is best. You can taste for salt and pepper during this period. The other delicious thing to do with this is to add small balls of mozzarella and make a wonderful Caprese salad. 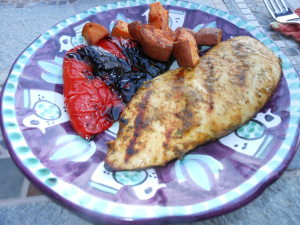 I also love this tomato sauce on grilled chicken. And on grilled bread as bruschetta!!! 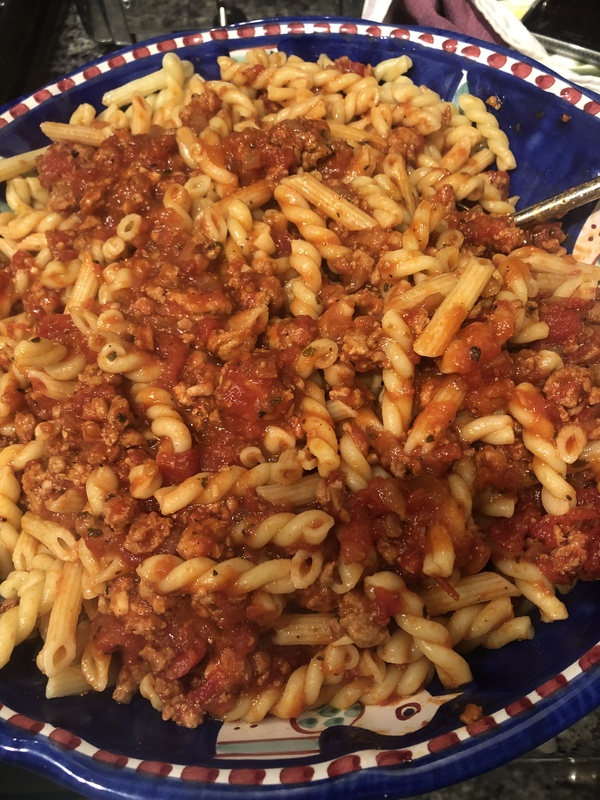 This recipe is sort of thrown together so there will be a lot of tasting as you go along, depending on the tomatoes you may or may not need extra salt and pepper. I made this for my grandson so I left out the crushed red pepper, if I were making for us I would have thrown in at least 1/2 teaspoon. Crushed red pepper can always be added at the table. *This should make about 6 servings, you can adjust to any amount you need, I used 1/2 for the 2 of us . app. 3 pints of grape tomatoes ( the little ones), you can use any beautiful fresh tomatoes especially in the summer months. You’ll just have to eyeball the amounts of tomatoes. I like the pieces cut small but you can just roughly chop up larger tomatoes. If you’re using cherry or plum tomatoes you can cut in half or quarters. It’s not an exact science. app. 18 basil leaves plus extra for serving. Nothing beats the taste of fresh basil in this so don’t omit. You’ll want extra for serving. I roll up the basil and use a kitchen shear to slice it. 1 pound pasta of your liking , I like a thin spaghetti best with this sauce. Angel Hair, Cappelini, any of these. 1 cup Fresh Grated Parmesan Cheese, plus extra for serving. 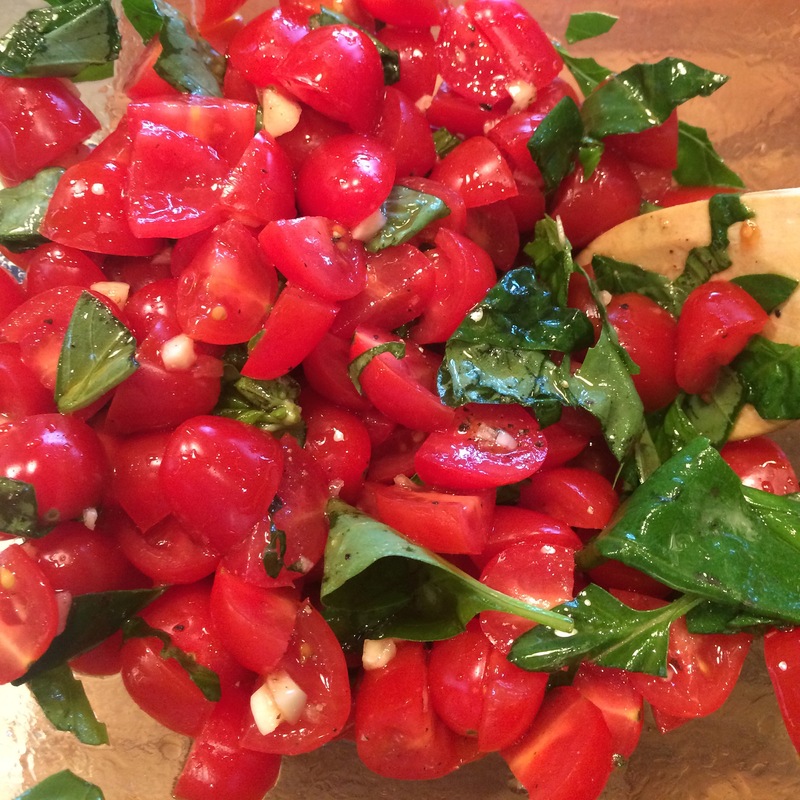 Combine the tomatoes, 1/2 cup olive oil, garlic, basil leaves, red pepper, salt and pepper in a large bowl. Cover with plastic wrap and just let it sit out on the countertop . The longer it sits the better, at least 2 hours to macerate and 4 hours would be ideal. Just before you are ready to serve, cook pasta. Cook al dente according to the box directions. 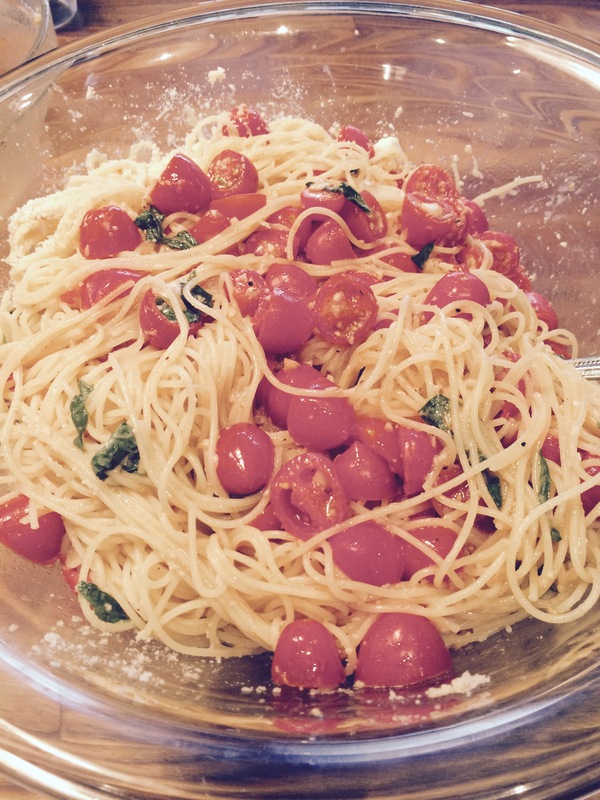 Angel Hair cooks up in under 5 minutes. Drain the pasta and add to the bowl with the tomatoes. Add in 1 cup of parmesan cheese and some more fresh basil if you’d like and toss well. Serve in big bowls with extra cheese on the side . Cheese will melt, so keep giving it some good tosses to integrate tomatoes and sauce. Amatrice is a small town in Italy outside of Rome and this dish is named for it. What I love most about this sauce is that it’s a return to simple Italian food, nothing excessive here. This dish is intended to be made with guanciale , which is a pig jowl and it tastes like a porkier version of bacon or pancetta. I use pancetta, which now comes pre-diced in packages making for a very easy time. I also keep packages of the diced pancetta in my freezer, they defrost very quickly which makes them a perfect dinner ingredient. I also use bucatini pasta which is thick and ropey with a hole like a straw. I wouldn’t wear white while eating this it’s a messy one. Super easy and delicious. I made it tonite with my marinated flank steak. 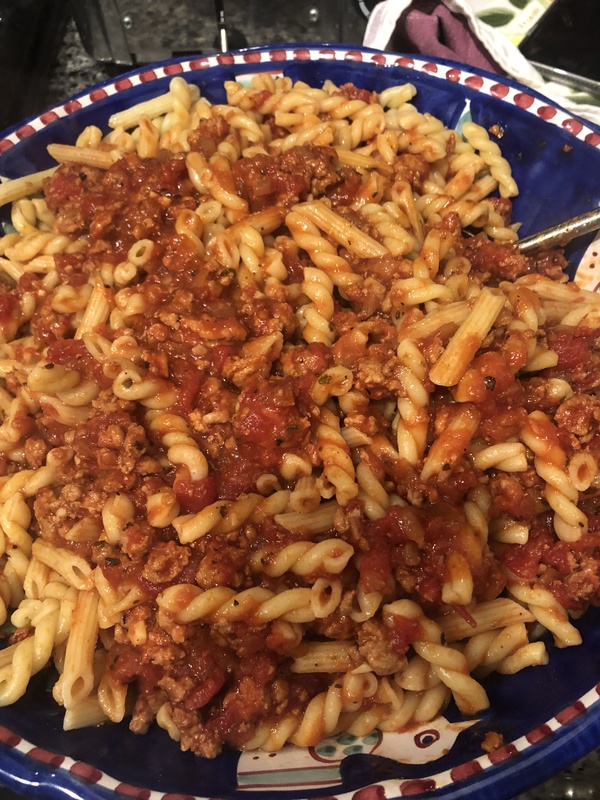 I also used 2 containers of grape tomatoes, but you can easily substitute with 1 large can of San Marzano tomatoes ( crushed )The cherry/grape tomatoes give it a lighter sauce, and I prefer it especially in the summer months but for the winter months or for a heavier tasting sauce use 1 28 oz. can crushed tomatoes with juices instead of fresh tomatoes. 45 minutes from start to finish and full of bright sophisticated flavors. 2 containers of tomatoes halved ( I used grape tomatoes , I love them ) or 1 can 28 oz. crushed or whole tomatoes with their juices. If using whole tomatoes just crush them with the back of a wooden spoon.